With the end of the semester quickly approaching, being proactive and organized is a priority that we all need to have! Although we understand that final exams and end-of-semester assignments can be daunting, we are excited to offer you an event next week that will help you get on track for a successful finals season. 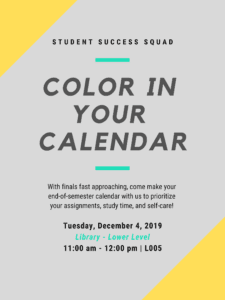 SUNY Broome’s Student Success Squad invites you to come to our “Color in your Calendar” event from 11 a.m. to noon Tuesday, Dec. 4, in L-005 in the library. Here, we will be stocked with colorful writing utensils and two-week calendars for you all to pick up and help organize yourselves for finals season. Each calendar will have a section for you to color code your courses, prioritize your work for each day of the week, and also have a quick message for self-care for you to take part in. We look forward to seeing you next week to jump into these last few weeks successfully!